Music in my (French) Kitchen ~ A huge thank you to Cathy from My Little Kitchen and Amy from Cooking with Amy for asking me to participate in this fun meme. My apologies for taking so long to finish this but this job/working thang is really cutting into my social life ;-) I've also been sick the past few days and nearly coughed up a lung last night. I am also musically braindead. Cathy, I hate to disappoint you but I’m sure my responses are far from fascinating! A little over 1 gig, about 16 CDs and a handful of random songs worth… do I listen to it all? nooooooooooooo….of course not! but then again my roommates Pierre & John always have their music playing and it's so much cooler and hipper than mine could hope ever be. Gwen Stefani, What You Waiting For & What’s My Life – It’s on Pierre’s iPod which he plugged into the stereo system. 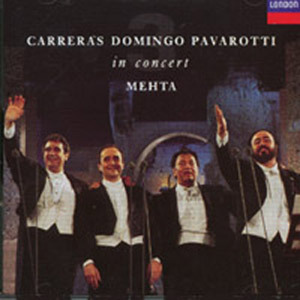 Anything from The Three Tenors in Concert, with Mehta in Rome 1990 – I LOVE THIS CD! When I taught Italian or Fresh Pasta cooking classes I always had this playing in the background and we’d start with some hot foccacia just out of the oven and a glass of 2000 Ottella Lugana made from grapes from the shores of Lake Garda, outside of Verona. La Dolce Vita! Here's a little background on this historic concert. It gives me goosebumps – what I would have given to be there! "On the evening of July 7, 1990, in the Eternal City, the phenomenon was born. The stars were shining and the Roman air perfumed and pleasantly cool when the downbeat was given, signaling 200 musicians to begin the overture to Verdi's I vespri Siciliani. Not even the Emperor Marcus Aurelius Antonius, otherwise known as Caracalla and in whose ancient baths the music echoed could have imagined such a sight. Long established as a venue for opera and concerts since their construction nearly 1800 years ago, these noble remains have seen many wonderful spectacles. But that night their stark and beautiful ruins framed three remarkable tenor voices joined together for the first time in one performance. Six thousand lucky souls were there to witness history..."
Tom Jones, Delilah – In the fall of 99, I worked on Bill Bradley’s presidential campaign and one night all of us on the advance team in New Hampshire went out to a bar that happened to have karaoke. One of the guys on the team, I think his name is Mo, to our surprise got up and sang Delilah. I’d never heard it before but we all sang along. This song always puts a smile on my face and reminds me of a wonderful experience with some great people. Johnny Nash, I Can See Clearly Now – I love this song! It’s the first song on my tape that I made (years ago!) for running (ok, jogging). It makes my toes tap, my heart soar, and my spirit fly…and always puts a huge smile on my face. Like I said, huge nerd! I'm up to the challenge! I'm working on it. I have a strong start already. Give me a little time. You might wake up to it on Sunday, Paris time. Hi Laura - I think this qualifies as fascinating! And how great that you love the three tenors concert as well! I think I played that video tape every day for a month - I was afraid I was going to wear it out. I haven't played it or listened to the CD in quite some time - seems like tomorrow would be a good time to pull it out again!